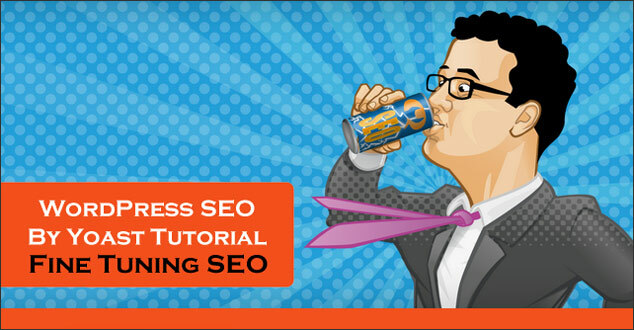 Are you wondering how to use WordPress SEO by Yoast to maximize SEO? WordPress SEO by Yoast is a powerful search engine optimization plugin that walks you through the optimization process on any WordPress post or page. If you have never used WordPress SEO by Yoast before, or if you are a seasoned user and would like to review it and perhaps pick up a few tips on how to maximize organic SEO, this tutorial is for you. This plugin was written by Joost de Valk and his team to help improve your site’s organic SEO. It is one of the most popular plugins in the WordPress Plugin Repository with over 8,800,000 downloads and an average 4.7 star rating out of 5. It will help you concentrate on the important aspects of fine tuning organic SEO on your website or blog. After you install and activate the WordPress SEO by Yoast plugin, go to a post or page. You will see the WordPress SEO by Yoast editor beneath the post/page editor. You will want to work on this area after you have entered the title and content for that post or page and before you publish. I will be focusing this tutorial on the General and Page Analysis tabs of the SEO editor. Under the General Tab, you will see four areas for optimization, the Snippet Preview, the Focus Keyword, the SEO Title and the Meta Description. You will have the opportunity to optimize this rich snippet. The focus keyword is a powerful option in WordPress SEO by Yoast. The focus keyword is not an area to enter a list of keywords. It is a place to include a word or phrase about the main idea of what that post or page is all about. In the example below, the focus keyword for this article is “WordPress SEO by Yoast Tutorial”. The graphic below shows the very dynamic function in WordPress SEO that helps you select the best keyword phrase based on your content and Google’s Suggest with a drop down menu. The following graphic shows an actual search of the keyword phrase on Google with Google Suggest’s drop down making suggestions based on what is typed in the search box. After you have entered your focused keyword, WordPress SEO displays a focus keyword “score” as in the example below. Your results may vary and you can use this tool to fine tune your focus keyword in the title, content and meta description of your article or page content. When you type your title into WordPress by Yoast’s SEO title field, keep in mind that you will want a unique title. It also reminds you to use your keyword phrase in the description and will suggest that you place it at the beginning. It will also suggest that you place your focus keyword at the beginning of the title when you review the optimization in Page Analysis. You can tweak the title at this point to make sure it is displayed exactly how you want it. If you have not filled in the meta description field in the WordPress SEO text editor, a rich snippet will be generated for you based on the keyword phrase that you have included in your page/post content. The search engines may also generate a rich snippet if it contains the keyword phrase the user is searching for. You should optimize the meta description by hand writing your own to provide an enticing, logical and accurate overview of your article or page content. You do not want to stuff keywords in the description. In the next step you will use the Page Analysis tab to receive further suggestions for organic SEO. 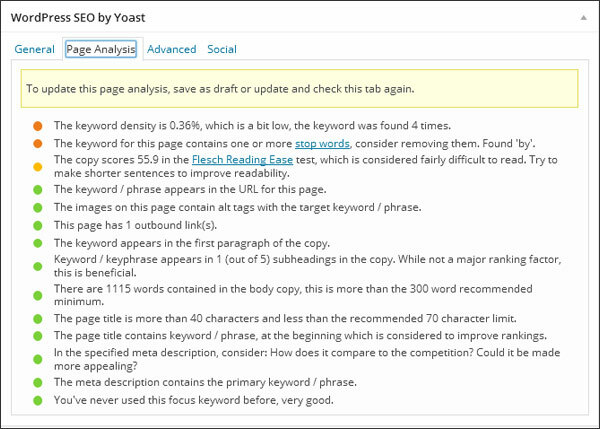 As seen in the example below, there are 14 different items that WordPress SEO by Yoast examines, from keyword density to previous use of the focus keyword. Analyze each area to see if it is logical to make more “tweaks” to the organic SEO. Shortening sentences to improve the readability. As for the “stop word”, it may not be a logical choice to remove the “by” in the focus keyword because it is part of the actual name of this plugin. 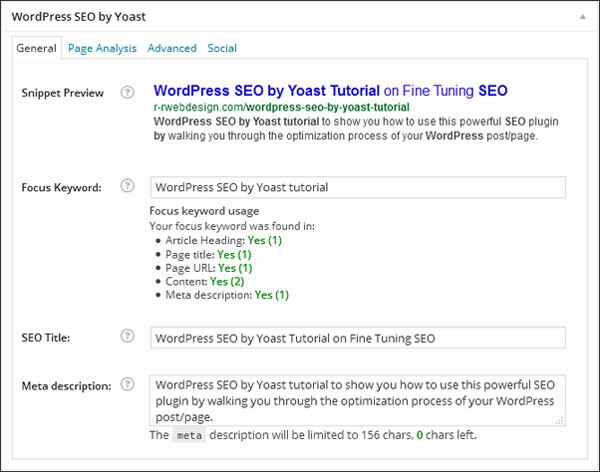 This WordPress SEO by Yoast tutorial is intended to provide a step by step guide to help you maximize the organic SEO on your WordPress blog or website with the General and Page Analysis sections of the plugin. Implementing these suggestions will not guarantee top placements in Google’s search engine results, but it will provide a solid foundation for building quality rich content. Google and other search engines just might reward your efforts. If you are a current user, I would love to hear your thoughts about your experience with using WordPress SEO by Yoast. If you haven’t used the plugin before, do you think that you might give it a try?